Based on a VONA from PVMBG, on 9 May a gas emission was observed at 1807 from Sangeang Api that rose to 4,150 m (13,000 ft) a.s.l. and drifted west. On 9 May the Aviation Color Code was changed from unassigned to Yellow. Based on analyses of satellite imagery, the Darwin VAAC reported that on 12 August an ash plume from Sangeang Api rose to 2.7 km (9,000 ft) a.s.l. and drifted NW. Based on analyses of satellite imagery, the Darwin VAAC reported that during 7-8 August minor emissions from Sangeang Api rose 2.4 km (8,000 ft) a.s.l. and drifted WSW. Based on analyses of satellite imagery, pilot observations, and wind data, the Darwin VAAC reported that during 29-30 July ash plumes from Sangeang Api rose to altitudes of 2.4-2.7 km (8,000-9,000 ft) a.s.l. and drifted NW and W.
PVMBG reported that observers at the Sangeang Api observation post in Desa Sangeang Darat, Bima, West Nusa Tenggara, reported that during 1 July-30 September diffuse white plumes rose up to 250 m above the crater rim. During 1 October-1 November white-to-gray plumes rose as high as 350 m. Beginning on 23 October occasional weak thumping noises were reported. Crater incandescence possibly indicated lava-dome growth or lava-flow advancement. The Alert Level remained at 2 (on a scale of 1-4); visitors and residents were warned not to approach the crater within a 1.5-km radius. Based on analyses of satellite imagery and wind data, the Darwin VAAC reported that on 8 July an ash plume from Sangeang Api rose to an altitude of 2.7 km (9,000 ft) a.s.l. and drifted over 35 km SE. Based on analyses of satellite imagery and wind data, the Darwin VAAC reported that on 7 July an ash plume from Sangeang Api rose to an altitude of 2.7 km (9,000 ft) a.s.l. and drifted over 35 km E.
PVMBG reported seismic and visual monitoring of Sangeang Api during 1-17 June. During clear conditions, incandescence at the summit and white-and-gray plumes (100-1,500 m above the summit) were visible. On 1 June seismicity dramatically decreased, and as of 17 June was still declining. The Alert Level was reduced from 3 to 2 (on a scale of 1-4) on 17 June. Based on analyses of satellite imagery and wind data, the Darwin VAAC reported that on 14 June an ash plume from Sangeang Api rose to an altitude of 2.1 km (7,000 ft) a.s.l. and drifted 55 km NW. Based on analyses of satellite imagery and wind data, the Darwin VAAC reported that during 4-7 June ash plumes from Sangeang Api rose to an altitude of 3 km (10,000 ft) a.s.l. and drifted 45-110 km W and NW. CVGHM reported that on 4 June the Alert Level for Sangeang Api was raised to 2 (on a scale of 1-4) due to recent increases in the number of earthquakes. White plumes rose 5-25 m during 1 May-3 June. "Sangeang Api . . . began to erupt on 30 July, with a series of explosions from the summit crater (Doro Api). The first explosion occured at about 0900 and produced a plume of tephra and gas to about 3,500 m altitude. Additional explosions occurred at 1130 (6,500 m), 1320 (6,500 m), and 1800 (1,500 m). Ashfall in Bima (50 km SW of the volcano), the capital of Sumbawa, totaled about 2 mm, and ashfall along the NE coast of Sumbawa, in the vicinity of the village of Wera, totaled about 2 cm. Between 30 July and 1 August, the 1,242 inhabitants of Sangeang Api island were evacuated to Sumbawa. Numerous additional Vulcanian explosions took place during the following week, reaching a maximum altitude of 2,500 m. Poor weather prevented systematic observations 1-5 August. On 6 August at 1939, a 0.7-km-long aa flow was observed advancing W from the region of Doro Api crater, toward the village of Doro Sangeang. By 9 August, the flow was 1.7 km long. "The most recent eruption of Sangeang Api was in 1966; earlier eruptions occurred in 1512, 1715, 1821, 1860, 1911, 1912, 1927, 1953, [1954-1958 (six eruptions)], and 1964. Typical activity begins with strong Vulcanian explosions followed within a few days by Strombolian explosions. Eruptions in 1953 and 1964 ended with a lava flow and weak Strombolian explosions. Lavas from Sangeang Api are of basaltic composition (49-51% SiO2)." "Sangeang Api continued to erupt in early September. Activity consisted of a single lava flow that has moved approximately 4.5 km W from Doro Api. The frequency of explosions has declined steadily from ~150/day in early August to ~50/day in early September. The maximum explosion cloud height was ~1 km. From 9 to 14 August, the number of small (M < 1) shallow volcanic earthquakes ranged from 190-400/day. By 6-11 September the number of volcanic earthquakes had decreased to 12-40/day." "A gas plume has been continuously emitted from the volcano since activity began on 30 July. In late August, the gas plume rose less than 0.5 km and was carried W by steady winds. The plume was translucent with a bluish gray to bluish white color. The larger explosions contributed dark gray clouds of fine tephra to the plume. Its SO2 content was in the range of 50-100 metric tons/hour when measured on 23 August." "The evacuation of the approximately 1,250 inhabitants from Sangeang Island was completed in early August. Inhabitants are in the process of moving their homes to Sumbawa Island." Information Contacts: J. Matahelumual and T. Casadevall, VSI. GMS images showed plumes from the initial 30 July activity (figure 1). Digital data analyses of temperatures at the tops of the plumes compared with radiosonde altitude profiles suggested that they reached a maximum altitude of 14.1 km (table 1), below the tropopause. However, Yosihiro Sawada notes that for both this and other eruptions, altitudes calculated with this technique seem to be consistently higher than estimates from ground observers. Table 1. Sangeang Api eruption cloud data from GMS satellite images on 30 July 1985. Maximum altitude of the eruption cloud is estimated by comparing the GMS digital temperature data with temperature/altitude data profiles from nearby radiosondes. No plume was evident on the image returned at 1100. A plume could be detected from 30 July at 1400 until 31 July at 0200, but none was visible 3 hours later. Maximum plume extent was reached at 1900. Information Contacts: Y. Sawada, MRI, Tsukuba. ". . . The daily earthquake count shows a steadily decreasing trend, and in early November the number of earthquakes was less than 30/day. The lava flow, first observed on 6 August flowing W from the region of Doro Api crater (toward the village of Doro Sangeang), had advanced to about 4.7 km from the summit by 1 October. The flow showed no additional growth during October." Photographs taken by astronauts from Space Shuttle mission 61A (30 October-5 November) showed a fairly dense plume extending roughly 50-100 km from Sangeang Api (figure 2). Figure 2. Space Shuttle photograph (no. 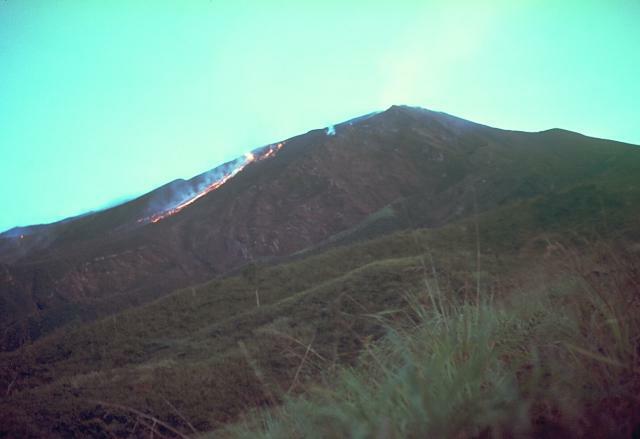 61A-40-062), taken 5 November 1985, showing a plume emerging from Sangeang Api, plus a portion of Sumbawa Island. Note that north is to the left. Courtesy of Charles A. Wood. Information Contacts: J. Matahelumual, Suparto S., and T. Casadevall, VSI; C. Wood, NASA. "Sangeang Api continued to erupt with 10-30 Strombolian explosions/day in November and the first week in December. The 1985 lava channel had not lengthened from the 4.7 km observed in late September. However, the volume of the main channel has grown because of a considerable increase in height during the past 2 months. A slow-moving lava flow in the central channel is located atop the main feeder tube. Periodic overflows of this channel add both fluid lava and rubble to the outer flanks of this tube. On 5 December, four separate overflows of fluid lava and rock rubble were observed rolling down the sides of the central channel. "A brief visit was made to the central crater on 4 December during a period of quiet. The active vent was a large cinder cone in Doro Api Crater. This central cone, which previously rose about 40 m from the floor of Doro Api, was estimated to be approximately 180-200 m above the floor during the 4 December visit. Thundering detonations were heard almost continuously during the 15 minutes spent in the crater and 1 mild Strombolian explosion hurled incandescent blocks. At night, a continuous reddish glow at the bottom of the gas plume over the crater suggested that a small lava lake may exist within Doro Api or the central cone. Fountaining of fluid lava, sheets, or ribbons was observed to accompany some of the larger Strombolian explosions at night. "We also confirmed the existence of a small-volume pyroclastic flow that was probably produced during the initial activity of 30 July. Local residents reported that the activity caused a number of small fires in the vicinity of Doro Montoy crater (just N of Doro Api) and the Sori Mbere drainage on the S flank of the volcano. A small block and ash flow, still hot to the touch, was found in the Sori Mbere drainage in December. Lahars generated by heavy rainfall and unconsolidated material on the upper slopes of the volcano have been common during and immediately after previous episodes. Outcrops along the shoreline indicate that a number of lahars and possibly also pyroclastic flows have entered the sea. Small mudflows were produced by heavy rains on 2 December. One traveled down the Sori Mbere drainage while a second mudflow entered the sea at Oi Nono Jara on the S side of Sangeang Island. "This pattern of activity conforms to that of previous 20th century eruptions of Sangeang Api. The 1911 activity included numerous explosions and a lava flow from the summit crater that moved more than 6 km down the W flank. The activity that began in March 1953 produced a lava flow and intermittent explosions through 1954. The 1964 eruption began on 29 January with strong explosions from the 1954 crater, and a lava flow first observed on 3-4 February moved N and E to about 750 m elevation. Explosions and outflow of lava continued for at least several months and possibly until the end of 1965." "Sangeang Api continued to erupt in December. Compositions of 30 July pumice and mid-August dense lava bombs are given in table 2." Table 2. Whole rock analyses of samples collected from Sangeang Api. X-ray fluorescence analyses by the USGS Laboratory, Denver, Colorado. Sample 1: pumice from eruption on 30 July 1985. Sample 2: ejected block, dense lava explosion mid-August 1985. Total iron expressed as Fe2O3; loss on ignition at 900°C. "Activity started on 30 July  from the main summit crater (Doro Api . . .). At about 0900 a thick plume rose to 3,500 m height. The eruption continued with explosions at 1130 (6,500 m), 1320 (6,500 m) and 1800 (1,500 m). About 2 mm of ash fell in Bima, 50 km SW of the volcano. Between then and 5 August explosions occurred every 30-60 minutes. Black plumes reached 2,000-2,500 m height. On 6 August at 1939 lava was observed flowing W from Doro Api crater. At the end of September the lava flow had advanced ~4,750 m. Numerous explosions took place from September to November, producing columns ~400-500 m high. On 17 November an explosion ejected incandescent lava fragments to ~250 m height and a plume rose to 1,200 m above the crater [see also 10:7-12]. During December and January, gas explosions, sometimes accompanied by ejection of incandescent lava fragments, averaged ~80 events/day. The 1,242 inhabitants of the island were evacuated to the main island of Sumbawa. There were no casualties." ". . . By comparison with activity in December and January, the frequency of small explosions increased slightly during February and March to ~80/day [but see 11:1]. The height of the eruption clouds averaged ~900 m. Since December 1985, no visits have been made to examine the 1985 lava flow, but continued lava production is suspected." Information Contacts: Olas, A. Sudradjat, and T. Casadevall, VSI. ". . . Activity consisted of small explosions with eruption clouds reaching <1 km above the crater. Persistent glow has been observed above the summit crater during the night, suggesting the presence of lava within the crater and in the 1985 lava channel which drains W from the crater." Observers at Sangeang Api reported no changes in the eruption . . . . Several explosions/hour at Doro Api crater and slow growth of the lava flow continued. Only rockfall earthquakes were recorded. The eruption continued through June with several explosions/day that produced clouds reaching ~1 km above the summit. A persistent reddish glow continued to be visible at night above Doro Api crater. Sangeang Api has been in continuous eruption for a year. Activity in July included several explosions/day, producing eruption clouds . . . ~1 km above the summit. A persistent reddish glow was visible at night above the Doro Api crater. "Explosions from the summit crater decreased in frequency during September." Summit explosions . . . were continuing in October. During November >130 explosions were recorded from Dori Api crater. The maximum height of eruption columns was 700 m. Continued extrusion of lava was suspected but not confirmed. No volcanic earthquakes were recorded. Explosions continued from Doro Api Crater, ranging from 40 to 70/day from December through the first week in January. Maximum plume height was 800 m. No volcanic earthquakes were recorded. About 60 small gas explosions/day continued to occur through February. Plumes reached maximum heights of 600 m. No volcanic seismicity was recorded. March eruptive activity consisted of ~250 small gas explosions with plumes reaching a maximum height of 600 m above the crater rim. Of the 22 earthquakes recorded during March, 17 were of tectonic origin (deep) and five were volcanic (shallow). Sangeang Api continued in eruption with an average of ~50 small explosions/day during April. The maximum plume height was 600 m. No earthquakes were detected during April. Information Contacts: T. Casadevall, USGS & VSI. Eruptive activity continued during May and June with ~50 explosions/day . . . . Plumes reached ~600 m above the crater rim. No earthquakes accompanied the explosions. Eruptive activity continued during July with ~45 explosions/day producing plumes to 600 m above the crater rim. No earthquakes accompanied the explosions. No VSI geologist has been able to visit the island to inspect the activity since early 1986. The eruption . . . continued in August, with ~25 explosions/day ejecting plumes to ~600 m above the crater rim. A seismometer 5 km from the summit recorded no earthquakes accompanying the explosions. September activity was similar to . . . August, with ~25 explosions/day. Plumes reached ~600 m above the crater rim. Eruptive activity continued in October at a rate of ~18 explosions/day, with plumes reaching ~600 m above the crater rim. The number of daily explosions has declined steadily from 50-70/day in early 1987, and the October rate is the lowest since the eruption started in July 1985. Eruptive activity continued during November and December at ~18 explosions/day, about the same rate as in October. The number of explosions . . . declined steadily from 50-70/day in early 1987 to ~15/day at the end of the year. By February, explosions had stopped, although fuming continued from the summit crater, producing a whitish plume. No earthquakes were reported during February. As of 21 February the seismograph was under repair so the volcano was monitored visually. During 9 March-24 May a "white ash plume" rose 10-150 m above the summit. During 27 April - 3 May the plume remained thin, but after 4 May it vacillated between thick and thin. Sangeang Api volcano, one of the most active in the Lesser Sunda Islands, forms a small 13-km-wide island off the NE coast of Sumbawa Island. Two large volcanic cones, 1,949-m-high Doro Api and 1,795-m-high Doro Mantoi, were constructed in the center and on the eastern rim, respectively, of an older, largely obscured caldera. Flank vents occur on the south side of Doro Mantoi and near the northern coast. Intermittent historical eruptions have been recorded since 1512, most of them during in the 20th century. According to the Center of Volcanology and Geological Hazard Mitigation (CVGHM), restlessness began at Sangeang Api in May and June 2009. In early May 2009 white emissions reached heights of ~ 5-25 m. In addition, occasional explosion earthquakes and generally minor seismicity continued (table 3). In addition, an earthquake struck on 1-2 June 2009 that was felt at a Modified Mercali intensity of MM I. Table 3. Summary of reported volcanic activity at Sangeang Api. Courtesy of the Center of Volcanology and Geological Hazard Mitigation (CVGHM). On 4 June the Alert Level was raised to 2 (on a scale of 1-4) due to the increases in the number of explosion earthquakes, tremor, and other local earthquakes. Residents and visitors were prohibited from climbing the volcano. No thermal anomalies have been seen in MODIS imagery between 1999 and August 2009. A recent translation of an older report from the Center of Volcanology and Geological Hazard Mitigation (CVGHM) discussed previously undocumented interval of eruptions at Sangeang Api (figure 3) during 1997-1999. These eruptions were described, along with other known eruptions, in broad terms in their report. They were generally explosive, with lava domes and lava discharges, similar to the eruptions of 1911, 1953, 1954, 1985-1988. Figure 3. A photograph of the 13-km-wide Sangeang Api taken on 15 October 2002 by Space Shuttle astronauts (photo STS-112-E-5628). A wide channel running W from provides a path for inferred lava and pyroclastic flows. Courtesy of NASA Earth Observatory. Dali Ahmad confirmed the occurrence of explosive activity during the 1997-1999 period. These took place without causing casualties because, since 1989, all of the island residents had departed to the nearby Sumbawa Island. No additional eruptions were indicated through at least 2009. In recent times the island's summit crater has produced intermittent steam clouds. Turner and others (2003) used Uranium-series isotopes to provide insights into Sangeang Api magma evolution. The volcano erupts potassic lavas (SiO2 ~47?55%) with a spectrum of xenoliths that record the liquid line of descent. The scientists estimated that the Sangeang Api magma chamber was about 6-10 km3 in volume and underwent cooling rates of ~0.05°C/year. Reference. Turner, S., Foden, J., George, R., Evans, P., Varne, R., Elburg, M., and Jenner, G., 2003, Rates and processes of potassic magma evolution beneath Sangeang Api volcano, East Sunda Arc, Indonesia: Journal of Petrology, v. 44, no. 3, pp. 491-515. Information Contacts: Dali Ahmad, Center of Volcanology and Geological Hazard Mitigation (CVGHM), Jalan Diponegoro 57, Bandung 40122, Indonesia (URL: http://www.vsi.esdm.go.id/); NASA Earth Observatory (URL: http://earthobservatory.nasa.gov/). This Bulletin reports Sangeang Api activity since our last report of December 2009, (BGVN 34:12) until 1 November 2013. Sangeang Api volcano resides in the Flores Sea of Indonesia (figures 4 and 5). Several seismic events and corresponding white plumes were observed in 2012 and 2013. The Alert Level corresponding to the events were temporarily raised then lowered. The Alert Level scale extends from a low of 1 to a high of 5. Figure 4. Sangeang Api volcano is on a 13-km-wide island of the same name located in the Lesser Sunda Islands of the Indonesian Archipelago. Figure 5. Sangeang Api seen in a N-looking view showing the summit area with active crater rim cut by the red triangle. A conspicuous older dormant crater lies NNE. Courtesy of Google Earth. The Indonesian government's Center for Volcanology and Geologic Hazard Mitigation (CVGHM) performs in situ visual, seismicity and satellite monitoring of Sangeang Api volcano and reports significant events. The same agency is also called Pusat Volkanologi dan Mitigasi Bencana Geolog - or PVMBG, a name that also appears on reports. 2009 - 2011 activity. Sangeang Api seismicity increased during May and June 2009 at the same time white plumes were observed with heights from 5 to 25 m. On 4 June 2009, CVGHM increased the alert level from 1 to 2 on the scale of 1 to 4. During 2010 and 2011 Sangeang Api reporting was unarchived on the web. 2012 activity. CVGHM reported that during 1-10 October 2012 Sangeang Api was often not visible due to fog; however when visible occasionally plumes were visible and rose as high as 20 m above the crater. The lava dome and surrounding areas had not changed compared to the beginning of the year. Both the number and magnitude of earthquakes increased on 5 October, declined during 6-8 October, then again increased on 9 October 2012. The Alert Level was raised to 3 on 10 October. CVGHM issued an eruption warning on 12 October 2012 based on increased seismic activity. They commented that surface activity had not been detected so far, but a new eruption from the summit lava dome would not be a surprise. However, the hazard warning status definitions are not a robust basis for describing predictions. CVGHM reported that during November through mid-December 2012 observers at the Sangeang, Bima District observation post (50 km SW) noted occasional diffuse white plumes rising 5-15 m above Sangeang Api's crater. The lava dome and surrounding areas had not changed compared to October observations. Avalanches had occurred on the W and SW flanks however their size was omitted. Earthquakes had declined. The Alert Level was lowered to 2 on 21 December. 2013 activity. CVGHM reported that 1-19 May 2013 diffuse white plumes rose 10 m above Sangeang Api's crater. Both the lava dome and surrounding areas showed no changes since November 2012. Seismicity had increased on 26 April 2013 which included 14 tremor events and remained high through June. From May through 13 June 2013 diffuse white plumes rose 10 m above Sangeang Api's crater. As many as 77 shallow earthquakes and 66 deep earthquakes had been detected daily (figure 6). The risk analysis by Surono (2013) noted that lava dome growth and avalanches had occurred on the W and SW flanks (figure 7). Note figure 3 seismicity records cease after 30 May 2013. In June 2013, 15 shallow earthquakes and three deep earthquakes were detected. The Alert Level was lowered to 2 on 14 June. The public were advised not to approach the craters within a radius of 1.5 km. Figure 6. Sangeang Api seismicity registered during the period 1 January - 28 May 2013. Later reporting by CVGHM states shortly after this period the seismicity decreased and the alert level decreased. Courtesy of CVGHM. Figure 7. Sangeang Api volcano, which is truncated by a sharp rim and central crater. This image accompanied the CVGHM risk and situation summary power point update on 30 May 2013 for alert level 3 volcanoes. Date, location, look direction, and photographer unknown. Taken from Surono (2013). Courtesy of CVGHM. Information Contacts: Dali Ahmad, Center of Volcanology and Geological Hazard Mitigation (CVGHM), Jalan Diponegoro 57, Bandung 40122, Indonesia (URL: http://www.vsi.esdm.go.id/); and NASA Earth Observatory (URL: http://earthobservatory.nasa.gov/). Due to elevated seismic activity, the Indonesian Center for Volcanology and Geologic Hazard Mitigation (CVGHM) issued an alert for Sangeang Api volcano on 21 May 2014. On 30 May 2014 at 1555, CVGHM reported an eruption of the island volcano that generated an explosive eruption column of ash and sulfur dioxide into the atmosphere, extending >3 km above the summit (figure 8). While the 13-km-wide island of Sangeang has no permanent settlements or residents, dozens of farmers cultivate land on the island during the growing and harvest seasons. Photographs of the eruption showed several pyroclastic flows coming down the volcano summit to the S and E that may be hazardous to anyone of the island. On 30 May, the Alert Level was raised from 2 to 3 (on a scale of 1-4). Civil authorities evacuated 135 people from within 1.5 km of the volcano to the mainland (nearby Sumbawa Island), with the result that no one was reported to have been killed or injured during the eruption. Figure 8. Eruption plume rising from Sangeang Api volcano on 30 May 2014, photographed to the N from Sambawa Island. Note the distinctive lenticular white cloud condensed from uplifted moist air carried by the rising plume. Pyroclastic flows can also be seen moving down along the S and E sides of the volcano. Courtesy of Anonymous (2014). Based on satellite images, pilot observations, and the Indonesian Meteorological Office, the Darwin VAAC reported that on 30 May an ash plume rose to an maximum altitude of 15.2 km and drifted 440 km E and 750 km SE (figure 9). Figure 9. After erupting, the Sangeang Api volcano sent an ash plume to the E, along with a distinctive lenticular white cloud condensed from uplifted moist air. Pilots in the area reported seeing the cloud rising to 19.8 km, spreading over a 40 km area. Photograph taken on 30 May 2014 by Sofyan Efendi looking N during a commercial flight from Bali to the fishing town of Labuan Bajo; from Hall (2014). The Indonesian Regional Disaster Management Agency (BNPB) reported that on 31 May two larger explosions occurred at 1330 and 2242 hrs. According to the VAAC, ash plumes from these two explosions rose to altitudes of 13.7-15.2 km and drifted 280 km NW (and other various directions, including S). Later in the day the ash plumes, including one from the previous day, eventually became detached. Ashfall affected many areas in the Bima Regency on the mainland, including Wera, and prompted the evacuation of 7,328 people from four villages within a radius of 8 km from Sangeang Api. The Bima and Tambolaka airports were temporarily closed. According to a news article, all flights to and from the Darwin International Airport in Australia on 31 May were canceled (figure 10). The VAAC noted that ash plumes rose to an altitude of 4.3 km on 1 June and drifted W and SW (figure 11). During 2-3 June ash plumes rose to altitudes of 3-4.3 km and drifted 45 km W. Based on analyses of satellite imagery and wind data, the Darwin VAAC reported that on 14 June an ash plume from Sangeang Api rose to an altitude of 2.1 km and drifted 55 km NW. Figure 10. The Moderate Resolution Imaging Spectroradiometer (MODIS) aboard the Terra satellite captured imagery of the eruption plume from Sangeang Api (dark brown line on the image extending from the volcanic island to the SE) at 0235 UTC (1035 local time) on 31 May 2014. Ash drifted SE, shutting down airports in Bima, Indonesia, and Darwin, Australia. Service to Darwin resumed by 1 June, but Bima remained shut down as of 2 June, according to the Jakarta Globe. Other satellites have observed the ash plume as well. A near real-time tool developed by University of Wisconsin and NOAA scientists estimated that the plume reached an altitude of at least 12 to 14 km based on observations from multiple weather satellites. The Ozone Mapping & Profiler Suite on Suomi NPP also observed ash drifting toward Australia on 31 May. NASA image courtesy Jeff Schmaltz LANCE/EOSDIS MODIS Rapid Response Team, GSFC; Caption by Adam Voiland. From NASA Earth Observatory (2014, 3 June). Figure 11. Landsat 8 satellite collected this true-color image of an ash plume rising from the Sangeang Api, an island volcano just of the coast of Sumbawa Island, Indonesia, on 1 June 2014. Note that on this day the plume is being blown W and then SW as compared with the previous day shown in figure 8. NASA Earth Observatory images by Robert Simmon, using Landsat 8 data from the USGS Earth Explorer. From NASA Earth Observatory (2014, 1 June). During the period from 2-17 June, thin to thick white smoke was ejected as high as 200-500 m. Seismic activity during the major part of the eruption is shown on Table 4; as of 17 June, seismicity continued to decline. The Alert Level was reduced from 3 to 2 (on a scale of 1-4) on 17 June. Table 4. Numbers of daily earthquakes measured for 3 days during and after the eruption of Sangeang Api, as reported by CVGHM. 'VB' represents shallow volcanic earthquakes; 'VA' represents deep volcanic earthquakes; 'TL' represents local earthquake tectonics; 'X' indicates activity present; 'nr' is not reported . Figure 12. 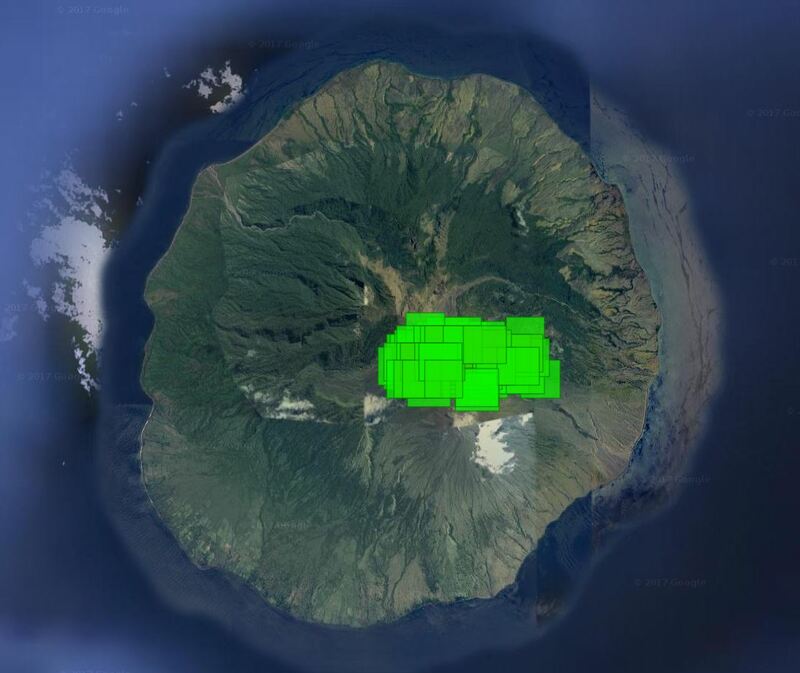 MODVOLC image for the period 30 May to 7 July 2014 of thermal alerts measured on Sangeang Api volcano. The volcano lies on the island of Sangeang just off the Indonesian island of Sumbawa. The central array of pixels trending E-W are for those alerts measured for the period 30 May - 30 June 2014. Courtesy of MODVOLC. Figures 13 and 14 show satellite images of ash plume temperature and SO2 plume from Sangeang Api volcano on 30 and 31 May 2014, respectively. The plume is obviously drifting to the E and S toward Australia. Figure 13. Composite of the Day-Night Band (DNB, red-to-yellow) at 750m resolution and the IR11.45 (I5, color scale at the top) channel at 375m resolution, image made 30 May 2014 at 1745 UTC. The DNB shows two craters at Sangeang Api volcano, Doro Api and Doro Mantoi. The brighter one was emanating the big plume with temperature values down to -196.5 K (76.6 °C) at the top. The secondary crater was emanating some material, but at much lower level so could hardly be seen. Courtesy of EUMETSAT (2014). Figure 14. SO2 measured from the Sangeang Api volcano plume on 31 May 2014 at 0535 UTC. The volcano is located at the W end of the measured area. Courtesy of NOAA. References. Anonymous, 2014 (30 May), Massive volcano eruption: Sangeang Api volcano - Sunda Islands, Indonesia, Before Its News web site (http://beforeitsnews.com/environment/2014/05/massive-volcano-eruption-sangeang-api-volcano-sunda-islands-indonesia-2502094.html). NASA Earth Observatory, 2014 (3 June), Sangeang Api Erupts (URL: http://earthobservatory.nasa.gov/IOTD/view.php?id=83799). Wright, R., Flynn, L.P, Garbeil, H., Harris, A.J.L., and Pilger, E., 2004, MODVOLC: near-real-time thermal monitoring of global volcanism, Journal of Volcanology and Geothermal Research, v. 135, pp. 29-49. Hall, J., 2014 (30 May), Pictured from a passenger plane: Menacing 12-mile-high ash cloud looms over Indonesia's 'Mountain of Spirits' after volcano erupts, Daily Mail (URL: http://www.dailymail.co.uk/news/article-2644253/Incredible-moment-huge-volcano-erupts-Indonesia-sending-ash-spewing-thousands-feet-sky.html). Information Contacts: Indonesian Centre for Volcanology and Geological Hazard Mitigation – CVGHM (also known as Pusat Vulkanologi dan Mitigasi Bencana Geologi - PVMBG)), Jalan Diponegoro 57, Bandung 40122, Indonesia (URL: http://www.vsi.esdm.go.id/); MODVOLC, Hawai'i Institute of Geophysics and Planetology (HIGP) Thermal Alerts System, School of Ocean and Earth Science and Technology (SOEST), Univ. of Hawai'i, 2525 Correa Road, Honolulu, HI 96822, USA (URL: http://modis.higp.hawaii.edu/); DARWIN VAAC (Darwin Volcanic Ash Advisory Centre), Bureau of Meteorology, Northern Territory Regional Office, PO Box 40050, Casuarina, NT 0811, Australia (URL: http://www.bom.gov.au/info/vaac/); Badan Penanggulangan Bencana Daerah (BPBD), Indonesian Regional Disaster Management Agency (URL: http://bpbd.malangkab.go.id/); and Badan Nasional Penanggulangan Bencana (BNPB), Indonesian National Disaster Management Agency (URL: http://www.bnpb.go.id/). On 21 May 2014 the PVMBG (Pusat Vulkanologi dan Mitigasi Bencana Geologi) issued an alert for Sangeang Api based on elevated seismic activity. An explosive eruption followed on 30 May (BGVN 39:02), sending a dense column of ash and sulfur dioxide billowing more than 3 km above the volcano. Two larger explosions occurred the next day. No further explosive activity was seen, but thermal anomalies were recorded by satellite-based instruments during June-December 2014 and March-November 2015.
Review of May-June 2014 activity. PVMBG reported that during January-29 May 2014 diffuse white plumes rose at most 25 m above the crater. On 30 May seismicity increased, with tremor starting at 0500 and becoming continuous at 1348. An eruption at 1555 generated an ash plume that rose 3 km and drifted W, causing ashfall over the sea. The Alert Level was raised to 3 (on a scale of 1-4). The island has no permanent settlements, and is only occupied during the growing and harvest seasons; civil authorities evacuated 135 people to the mainland. Based on satellite images, pilot observations, and the Indonesian Meteorological Office, the Darwin VAAC reported that the 30 May ash plume rose to an altitude of 15.2 km and drifted 440 km E and 750 km SE (figure 15). BNPB reported that on 31 May two larger explosions occurred at 1330 and 2242 hours. According to the VAAC, ash plumes from those explosions rose to altitudes of 13.7-15.2 km and drifted 280 km NW and other various directions. Later in the day the ash plumes became detached. Ashfall affected many areas in the Bima Regency on the mainland, including Wera, and prompted the evacuation of 7,328 people from four villages within a radius of 8 km from Sangeang Api. The Bima and Tambolaka airports were temporarily closed. According to a news article, all flights to and from the Darwin International Airport in Australia on 31 May were canceled. The VAAC noted that ash plumes rose to an altitude of 4.3 km on 1 June 2014 and drifted W and SW. During 2-3 June ash plumes rose to altitudes of 3-4.3 km and drifted 45 km W. During clear conditions on 1-17 June, incandescence at the summit and white-and-gray plumes (100-1,500 m above the summit) were visible. On 1 June 2014 seismicity dramatically decreased, and as of 17 June was still declining. The Alert Level was reduced from 3 to 2 (on a scale of 1-4) on 17 June. Activity during 2015. PVMBG observers at the Sangeang Api post in Desa Sangeang Darat, Bima, West Nusa Tenggara, reported that during 1 July-30 September 2015 diffuse white plumes rose up to 250 m above the crater rim. During 1 October-1 November 2015 white-to-gray plumes rose as high as 350 m. Beginning on 23 October occasional weak thumping noises were reported. Crater incandescence possibly indicated lava-dome growth or lava-flow advancement. The Alert Level remained at 2 (on a scale of 1-4); visitors and residents were warned not to approach the crater within a 1.5-km radius. Thermal anomaly data. Nearly daily thermal alerts were measured by MODVOLC (using MODIS data) following the 30 May eruption from 7 June until about 27 December 2014. Alerts appeared again, frequently but not daily, between 17 March and 13 October 2015, with a final alert pixel on 5 November 2015. MIROVA measured low to medium radiative power thermal anomalies from early June 2014 until late November 2015. Information Contacts: Pusat Vulkanologi dan Mitigasi Bencana Geologi (PVMBG, also known as Indonesian Center for Volcanology and Geological Hazard Mitigation, CVGHM), Jalan Diponegoro 57, Bandung 40122, Indonesia (URL: http://www.vsi.esdm.go.id/); Darwin Volcanic Ash Advisory Centre (VAAC), Bureau of Meteorology, Northern Territory Regional Office, PO Box 40050, Casuarina, NT 0811, Australia (URL: http://www.bom.gov.au/info/vaac/); The Guardian News (URL: https://www.theguardian.com/world/2014/may/31/indonesian-volcanic-ash-cloud-halts-flights-in-and-out-of-darwin); MIROVA (Middle InfraRed Observation of Volcanic Activity), a collaborative project between the Universities of Turin and Florence (Italy) supported by the Centre for Volcanic Risk of the Italian Civil Protection Department (URL: http://www.mirovaweb.it/); Hawai'i Institute of Geophysics and Planetology (HIGP), MODVOLC Thermal Alerts System, School of Ocean and Earth Science and Technology (SOEST), Univ. of Hawai'i, 2525 Correa Road, Honolulu, HI 96822, USA (URL: http://modis.higp.hawaii.edu/, http://modis.higp.hawaii.edu/). Strong explosions at Sangeang Api on 30-31 May 2014 generated ash plumes that rose as high as 15 km altitude, followed by less intense activity that produced ash plumes during the first half of June 2014 and 1 July-1 November 2015 (BGVN 41:10). No further activity was reported by the Pusat Vulkanologi dan Mitigasi Bencana Geologi (PVMBG) and Darwin Volcanic Ash Advisory Centre (VAAC) until June 2017. The MIROVA (Middle InfraRed Observation of Volcanic Activity) system detected thermal anomalies in MODIS satellite data near the summit during the second week of January 2017, when four were recorded (figure 16). The number increased significantly beginning with the latter half of February. Another increase in the number and power of the anomalies took place at the beginning of June 2017 and continued into mid-August. Figure 16. Thermal anomalies identified by the MIROVA system (radiative power) at Sangeang Api for the year ending 11 August 2017. Note that the anomaly lines in late 2016 are not on the island. Courtesy of MIROVA. Thermal anomalies identified using the MODVOLC algorithm were first recorded on 25 February 2017. Over the same time period as the MIROVA data, through 11 August, there were 105 thermal alerts. Cumulatively, the locations of the alert pixels define an area extending from the summit crater to about 2.5 km down the E flank (figure 17). Figure 17. Thermal anomalies (alert pixels) identified by the MODVOLC system at Sangeang Api for 25 February-11 August 2017. The eastern-most pixels are at the summit area. Courtesy of HIGP - MODVOLC Thermal Alerts System. According to PVMBG, a small Strombolian eruption at 1154 on 15 July 2017 generated an ash plume that rose 100-200 m above the crater rim and drifted SW. Seismicity had increased starting in April. Based on analyses of satellite imagery, PVMBG observations, and wind data, the Darwin VAAC reported that on 16 July an ash plume rose to an altitude of 2.1 km, or 200 m above the crater rim, and drifted NW. The Darwin VAAC also reported ash plumes to altitudes of 2.4-4.3 km on 19-20 July, 29-30 July, 7-8 August, and 12 August 2017; in most cases they drifted NW. Sangeang Api volcano, one of the most active in the Lesser Sunda Islands, forms a small 13-km-wide island off the NE coast of Sumbawa Island. Two large trachybasaltic-to-tranchyandesitic volcanic cones, 1949-m-high Doro Api and 1795-m-high Doro Mantoi, were constructed in the center and on the eastern rim, respectively, of an older, largely obscured caldera. Flank vents occur on the south side of Doro Mantoi and near the northern coast. Intermittent historical eruptions have been recorded since 1512, most of them during in the 20th century. Turner S, Foden J, George R, Evans P, Varne R, Elburg M, Jenner G, 2003. Rates and processes of potassic magma evolution beneath Sangeang Api volcano, East Sunda Arc, Indonesia. J Petr, 44: 491-515. There is no Deformation History data available for Sangeang Api. Sangeang Api is a small volcanic island off the NE coast of Sumbawa Island. Two large volcanic cones, Doro Api in the center and Doro Mantoi on the right, were constructed within and on the south rim of a largely obscured caldera. 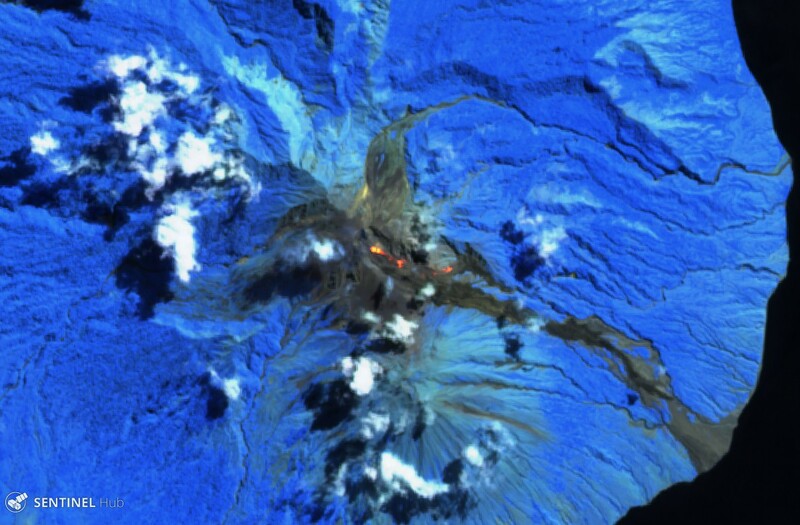 Intermittent eruptions have been recorded since 1512, but the volcano has been frequently active in the 20th century. Photo by Tom Casadevall, 1985 (U.S. Geological Survey). An eruption column rises above Doro Api peak of Sangeang Api volcano on August 25, 1985. The eruption, which began on July 30 and lasted until February 1988, included explosive activity, pyroclastic flows, and a lava flow that traveled 4-5 km down the western flank. A lava flow descends the west flank of Doro Api at Sangeang Api volcano on December 4, 1985. 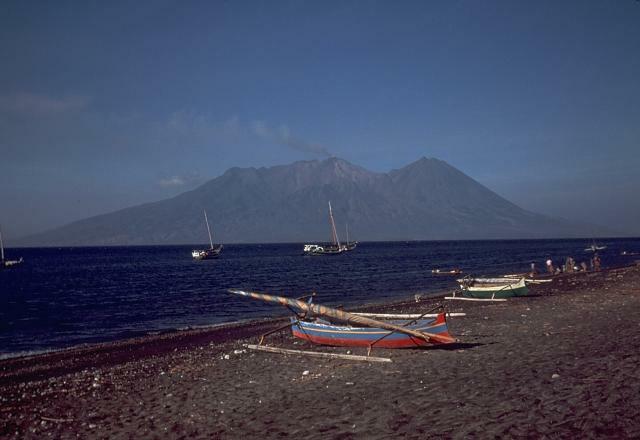 The eruption began on July 30; pyroclastic flows forced the evacuation of the island's 1242 inhabitants. The lava flow eventually traveled 4-5 km before stopping in June 1986. Explosive activity continued until February 1988. 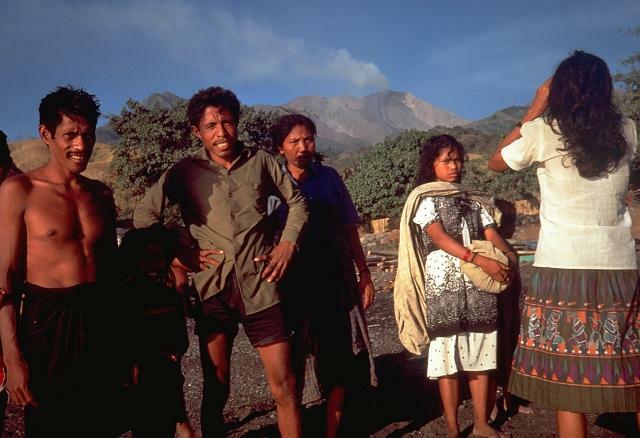 Islanders prepare to evacuate on August 25, 1985, as Sangeang Api volcano erupts in the background. The eruption began on July 30, and included pyroclastic flows that eventually forced the evacuation of the island's entire 1242 inhabitants. 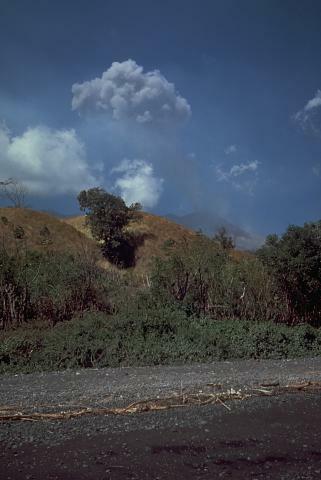 An eruption of Doro Api at Sangeang Api volcano is observed from the village of Doro Mewanga on September 18, 1964. The eruption began on January 29, 1964 and lasted until the end of 1965. During the eruption strong explosions took place from the summit crater and a lava flow traveled down to 750 elevation. 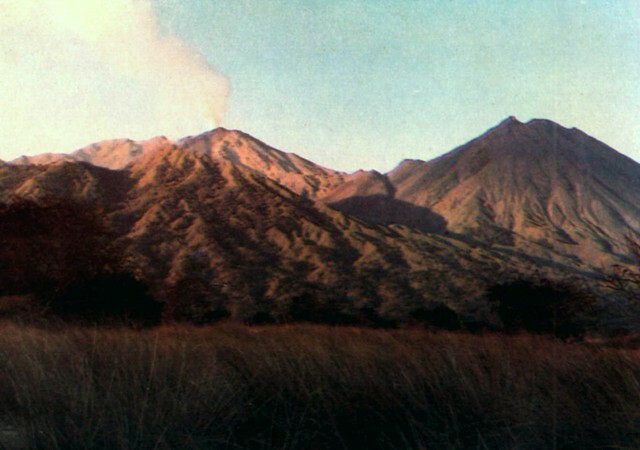 Photo courtesy of Volcanological Survey of Indonesia, 1964. A column of "smoke" rises in 1985 above Doro Api, one of the two large post-caldera cones of Sangeang Api volcano. Doro Mantoi appears at the right in this view from Sori Buntu on the southern flank. An eruption that included both explosive activity and the effusion of lava flows down the western flank began in July 1985 and lasted until February 1988. 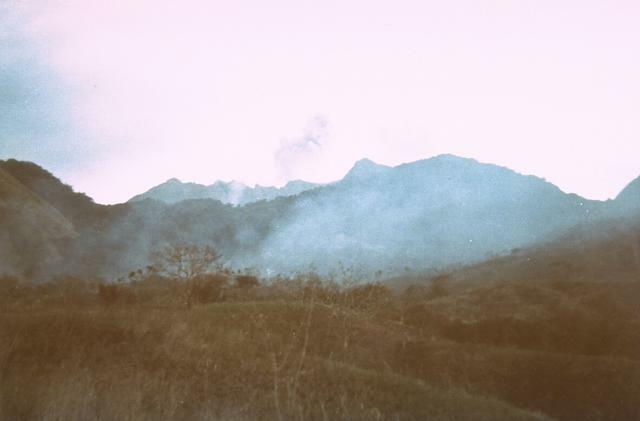 Photo by Samud W., 1990 (Volcanological Survey of Indonesia). There are no samples for Sangeang Api in the Smithsonian's NMNH Department of Mineral Sciences Rock and Ore collection. Large Eruptions of Sangeang Api Information about large Quaternary eruptions (VEI >= 4) is cataloged in the Large Magnitude Explosive Volcanic Eruptions (LaMEVE) database of the Volcano Global Risk Identification and Analysis Project (VOGRIPA).